Taken from Issue No.13 - The Dog Issue. 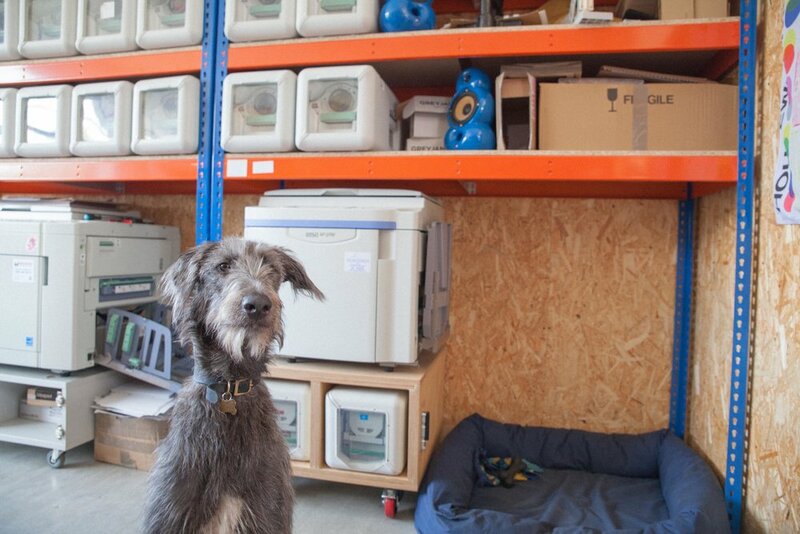 Joseph runs Housework(press), a Risograph printers and publishing house in Lower Sydenham with help from his wife Lauren and their handsome studio dog Shoji. They live together in Nunhead. When did you set up Housework(press)? I set up Housework(press) in 2016 pretty much straight after I graduated from the RCA [Royal College of Art]. It was initially a means of production for personal work, but quite quickly it turned into a means of employment – a way of giving myself a job within the very competitive design industry. It started off in our living room – hence the name, Housework. But fairly quickly I outgrew the space and took up residence in Black Tower Projects, which is a fantastic not-for-profit project space and artists’ studio provider based in Lower Sydenham. A few months later Lauren took up a studio there too where she runs her artist practice from, but she often helps out at Housework(press) too. When did you get Shoji and what made you want to add a dog into the mix? We got Shoji last year in October – he’s only 10 months old! We’re dog people through and through so we’ve been wanting one for ages. But it wasn’t until we both had studios in the same building that getting a dog felt possible and something we could factor into our daily routine. Making sure we got a breed that we suited was always incredibly important to us. After a lot of research we finally settled on the Scottish Deerhound – not the obvious choice for your first dog, but despite their large size they are very quiet dogs who are most happy curled up on the sofa. So he made a lot of sense for studio life – and his relaxed and friendly temperament is always really calming when a stressful deadline crops up! Can you tell us a bit about the work you produce and print at Housework(press)? Housework(press) is a Risograph printing press. Risograph is a print process that sits somewhere between a silkscreen print and a photocopy – it prints single colours through a mesh screen onto paper, however it is also incredibly efficient and economical in its yield. Its original use was for high volume printing, most commonly for political parties, churches, schools and hospitals, but because of its beautiful and rich print quality it’s becoming increasingly adopted by the creative community. I print a lot of books, zines, artist editions, posters, flyers and invites. Because it’s a relatively new medium, I feel very excited to be involved in the process at this point in time – artists, illustrators and designers are really starting to push and experiment with the process with really exciting results. A huge array of work gets printed at the studio every week and I am always so thrilled to see it come into form, and I learn a lot from these individual approaches to the process too. Have you found city life has changed since having Shoji? Not too much has changed, though we have definitely spent more time exploring the surrounding green space, which before we probably took for granted. We love Nunhead Cemetery and the Rye, which is where we mostly wander round at the weekends. On work days we walk for an hour in Beckenham park which has been a wonderful addition to our routine, it’s such a great space and we love the woodland there. Has Shoji got you into any entertaining situations? Shoji is a big naughty puppy, so there’s never a dull moment and he keeps us on our toes constantly! Have you found having Shoji has introduced you to more people? Yes absolutely, we only know of one other Deerhound in the area, so people are always very interested to meet Shoji. But introductions tend to be in that classic dog walker manner where you all know each others’ dog’s name but not the owner’s! What are your favourite dog friendly hangouts/places/shops in SE London? The Beer Shop on Nunhead Green is always warm and welcoming, and Ayres Bakery just down the road is resolutely dog friendly.